Scott McBee is a New York based artist and designer. He received his BA in graphic design and illustration from San Diego State University. In 1989 Mcbee launched a successful career in commercial illustration, designing for such major firms as Young & Rubicam, BBDO and Ogilvy. A celebration of the Grand Dames of the sea, McBee's nautical series reflects a life-long passion for ocean liners and yachts. With painstakingly precise detail, McBee's large format gouache paintings (typically 3 x 9 ft. on acid free 90-lb. Paper) are rendered in bright, accurate livery, and continue in the tradition of historic naval architectural painting. Mcbee is currently showing at the Chinese Porcelain Company, the South Street Seaport Museum in lower Manhattan, and as part of the permanent collection at The Master Works Foundation in Bermuda. 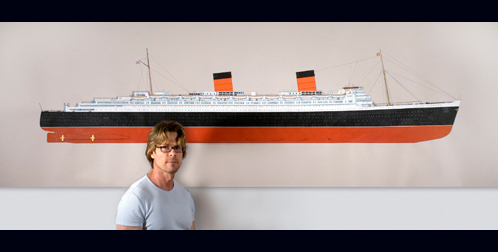 Many of his fine commissioned yacht portraits reside in private family collections as well.